CHOKRA is a performance artist from the United Arab Emirates. His multi-dimensional performances integrate multi-lingual rap rhymes uttered in Arabic, Urdu, Hindi, Pashto, Bengali and English, live surrealistic visuals combined with digital and analogue sound, an algorithmic processing of electronic operatives via custom software and a heightened build of the theatrical with transnational costume. 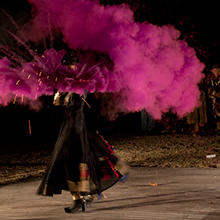 CHOKRA’s performances also accelerate the hyper sensory with an epic propagation of aromatic scent, Emirati oud, neon pyromania, brilliant hues in exploding pigments, crushed gold and powdered sandalwood. Al-Mtsaalh Haal (The Trucial Case) is a project by the performance artist CHOKRA (Conscious Hoarding of Kinetic Rage Associated) that integrates negotiable research in an executable performance. It investigates CHOKRA’s own origin of The Trucial States in a constructed overlay of saturated historicity and incisive performance. With multilingual orientations informing Al-Mtsaalh Haal, CHOKRA shall consider performance dynamics in an Origin(al) theatrical construct for a heightened acceleration of consolidated potential. As virtual assertions of CHOKRA’s origins superimpose in multilingual/negotiable states or as encompassed possibilities, Al-Mtsaalh Haal utilizes the encircling reciprocal distance of a situated origin as a conceptual impetus for kinetic operatives. For a concise and intense duration at the Watermill Center, CHOKRA shall research, examine, experiment, compose and construct an open rehearsal of Al-Mtsaalh Haal. He shall script, vocalize and synthesize his investigations into his Origin(al) portals of The Trucial States to engage in an inconclusive mutuality of performance. Al-Mtsaalh Haal shall be facilitated with a live and electronic apparatus that features an assimilated composition of digital and analogue sound, programmed video, real time algorithmic animations and multiple projections. CHOKRA’s open rehearsal for Al-Mtsaalh Haal will also configure in a historical collapse, with multilingual rap rhyme sequences conducted in Quranic Arabic, Urdu, Hindi, and English; transnational costume; and a consuming dispersal of original accouterments, including saturated pigment, scent, crude oil, pyromaniac emissions, spices and powdered chilies.